The Buzzer blog » Happy 94th birthday to the Buzzer! Images of the Buzzer's first issue! At bottom right is a picture of the jitneys, private cars that competed with the streetcar system. Click for a much larger look! The Buzzer was originally launched so the streetcars could compete with jitneys, private citizens who patrolled streetcar routes and offered rides for five cents. Jitneys were banned in July 1918, but the Buzzer kept going for another 90 years and counting. For a Buzzer history treat, have a look at the main Buzzer page on the TransLink website — go to “Related Documents” on the right side, and you’ll find scanned Buzzer issues all the way back to 1960. Make sure to let me know if you see tidbits to share. More issues from the 1950s will be uploaded soon! You can also see four fun issues from the Buzzer’s 93rd birthday. Last but not least, here are the PowerPoint slides from the talk I gave to the Vancouver Historical Society last Thursday — you can read the slide notes for a rough outline of its content. Chuck Davis also posted a description of my talk over at the KnowBC blog. Expect video and audio eventually, thanks to Karen and Jason! Life on transit: talk Buzzer history in a Google Hangout today, March 27, 2013! Happy birthday to the Buzzer! Jhenifer, thank you for all your hard work making the Buzzer what it is today, and for uploading that treasure trove of back issues! 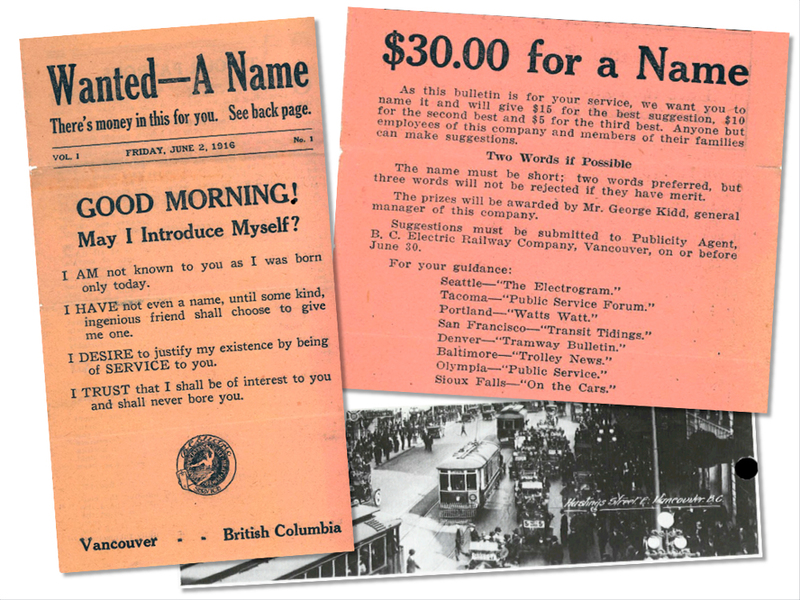 Regarding curious tidbits, as you’ve mentioned in the past, when the Buzzer was published by BC Electric and BC Hydro, it almost shamelessly promoted practically anything to do with any of their business interests: especially electricity and highway bus travel. In the same issue, there is also a random assortment of articles on household poison safety; the upcoming PNE; and three articles promoting bus service to racetracks, Barkerville, and the Okanagan. I’d also like to say happy birthday to the Buzzer! It certainly has been an interest to me and has never bored me! And the PowerPoint took about 5 minutes to download on my computer (I guess it’s a big file? ), but it was worth it. Sounds like it would have been interesting to hear! And thanks for your continued work on the Buzzer, Jhen! A small niggle, Jhen – on the Buzzer archive pages from the 1960s (at least), the files are broken down by year but they all have the same date, probably when they were uploaded – April 2010. Could these be changed to show the dates of the Buzzers instead? Thanks! Deano: Oops — yes, the incorrect dates on the 1960s issues are a known issue and someone will be fixing it! Happy 94th Birthday Buzzer Blog ! ! !